The latest prices for property in the Acton area suggest that the strong surge in prices seen during January and February has not been sustained. Both months saw and average of over £350,000 but since the beginning of March property sales averaged just over £300,000 according to Land Registry figures. This is still above the levels seen at the end of 2009. The April data from Land Registry's House Price Index shows an annual price increase of 14.8% in London. 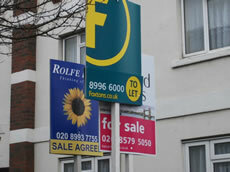 For England and Wales prices are up by 8.5%. This is the sixth month in a row in which the figure has been positive and takes the average property value in England and Wales to £165,596. The Nationwide House Price index for April shows a 10.1% increase the first double digit annual increase since 2007. Commenting on the figures Martin Gahbauer, Nationwide's Chief Economist, said, "the more important driver of rising house prices has been the low level of stock for sale, as many homeowners and buy-to-let landlords continue to wait for prices to recover to peak 2007 levels before deciding to sell up or move. The very low level of interest rates has been supportive of this wait-and-see approach, particularly in the buy-to-let sector." He is anticipating that prices will flatten out over the next few months due to the petering out of new buyer enquiries at estate agents offices and an increase in the number of instructions from sellers.